For many workers agents and brokers among them taking time away from their jobs feels like an untenable luxury. For many workers — agents and brokers among them — taking time away from their jobs feels like an untenable luxury. And unfortunately, this problem doesn’t just exist in retail establishments around the holidays. Across all job types and industries, Americans are working more than ever. According to a recent Workforce Management study, since the great recession, 55% of employees have seen their workload increase, and 27% say it’s doubled. The constant pressure to do more with less, coupled with the belief that being busy means we’re important, is creating an unsustainable pattern. For many workers—life insurance agents and brokers among them—taking time away from their jobs feels like an untenable luxury. Most European countries provide workers at least four weeks of vacation each year—Germany and Sweden are particularly generous with seven weeks. But a Center for Economic Policy and Research study reveals that 25 percent of US employees don’t take any vacation at all—either because they don’t use their accrued time or their employer doesn’t provide it. Why would anyone choose not to take the time away that they’ve rightfully earned? For many, fear is a factor—fear of missing out on promotions, topping the layoff list, being judged by bosses or coworkers, or the work that will inevitably pile up. 1. Working too much makes us stupider. Research has shown that long hours affect our brains. An American Journal of Epidemiology study followed British civil servants over five years to understand the relationship between long hours and brain functioning. Compared to those who worked forty hours per week, participants who worked more than fifty-five hours showed poorer vocabulary and reasoning skills. In plain English, working too much actually makes us stupider. 2. 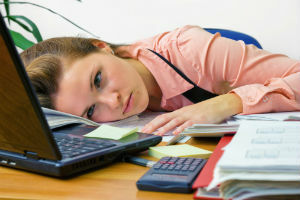 Working too much makes us depressed. Research has shown that long hours are also a significant risk factor for depression. A study published in PLoS ONE examined more than 2,000 workers in the United Kingdom over six years. They found that employees who worked more than eleven hours per day had more than twice the risk of depression than those who worked seven to eight hours per day. The relationship remained even when researchers statistically removed the influence of socio-economic factors, chronic physical disease, smoking and alcohol use. 3. Working too much hurts our career advancement. When people think about how to get ahead in their career, most have a “more is better” approach. Just look at the hours worked at many law firms, tech companies, and Wall Street. However, more hours does not always equal better performance, and human beings have an upper limit for productivity on any given day. Somewhat counter intuitively, a 2006 Ernst & Young study that found a positive relationship between vacations (i.e., fewer hours overall) and performance: For each additional ten hours away from the office employees took, their performance reviews were eight percent higher the following year! 4. Working too much can actually kill us. In August of this year, a 21-year old Bank of America intern was found dead in his London dorm room. During the course of Moritz Erhardt’s demanding seven-week internship, he had pulled eight all-nighters in two weeks. Although Erhardt’s case is as rare as it is tragic, it reflects the general trend that working too much is simply not healthy. Luckily, when we take time away, these effects are mitigated. For example, the Framingham Heart study (a massive longitudinal research program started in 1948) reported that when workers take annual vacations, their risk for a heart attack is reduced by 30% in men and 50% in women. Hopefully, cashing in some of that vacation time feels more important than it did a just few minutes ago. But if the idea of taking time off still feels difficult or stressful, here are a few tips. First, it’s okay to start small. Short vacations have similar positive effects as long ones; one study from Radboud University Nijmegen in the Netherlands found that even vacations of just a few days increased health and well-being. And because benefits from most vacations fade after 5 days, frequent, shorter vacations may actually be better. So instead of blocking off two weeks and paying for it when you return, try a long weekend every month or two instead. Second, it’s okay to check e-mail a few times while you’re away. The above study also revealed that people who worked during vacations still showed increases in health and well-being, albeit smaller ones. For many workers, being able to check in at work eases anxiety. So, within the bounds of reason, go for it! Just don’t let things get out of hand, lest your spouse or partner lock your iPhone in the hotel safe. Whether you’re being forced to work this Thanksgiving or not, the holidays are a great time to re-prioritize. It’s important to remember that family and friends are life’s true gifts. After all, on their deathbeds, few people are likely to say “I wish I had spent more time at work.” So for goodness sake—take some time off!